Columbia is a country that talks positively about their economy — seriously, these places really do exist. As a ‘Westerner’ you don’t fully realise just how frequently we’re absorbing negative economy stories in our media. But when you land somewhere like Bogotá, Colombia and all the locals talk about is investment, shopping and trade you realise that outside of our little recession bubble, the rest of the world is thriving. And I, for one, am ever so slightly jealous. Of course, Colombia isn’t the only country labelled as an emerging market. The South American hub is part of an impressive club that includes Nigeria, Ghana, India and Pakistan amongst others and all of these countries are experiencing a surge in growth, technology and disposable income despite the recession’s affect on Western economies. As a result, my Bogotá travel plans announcement garnered blank faces from my friends and family, then a tirade of concern regarding my welfare. Will the Medellin drug cartel grab me? Will I unknowingly become a drug mule? Will I end up in the jungle with FARC? All in all, no one was over-enthusiastic about my chances of returning intact and not in the clutches of a drugs lord. And therein lies the problem, most of us are still thinking of the Colombia of 20 years ago when Pablo Escobar ruled 80% of the world’s global cocaine market. Hate to break it to you, but much has changed. With its impressive natural resources (like coffee, coal and flowers), in the words of Colombia’s infamous son, the economy’s looking to “go hard.” Because of this, you’re faced with a workforce that has an increasing amount of disposable income. No more so is this evident than on the roads of Bogotá. Getting anywhere during rush hour is literally a headache. The roads were clearly not built for so many cars, and you can feel the city giving a collective groan at 5 p.m. and workers have to maneuver home. In fact it’s like the survival of the fittest – even the most hardened London driver (like myself!) would struggle so the country’s government is looking for investment in roads and transport. The transportation ministry is even mulling over the idea of installing an underground system, which is a logical option mostly because of where and how Bogotá was built. A beautiful city high up in the mountains with an impressive skyline, Bogotá unlike virtually every other capital city in the world because it is not near to a river or the sea, which used to be the only way to import and export goods, so there’s a lot of land to work with for development. I visited a social housing project called Ciudad Verde, which when finished will house thousands of Colombians who live in poverty. In effect the Colombian government has built a new city within a city, which will not only have accommodations but also schools, hospitals and shops. In terms of shopping, Bogotá Fashion Week, a fixture in the Latin American fashion market, had just started when I arrived in the country. The stylish event featured catwalk shows from some of the most renowned local designers like Gabi Arenas, Nora Julieth Lozza and Estrada – with almost 17 thousand domestic and international buyers in attendance. The Latin American fashion market is largely ignored by most British high street names now but it’s crying out for British design talent, not just because of the affordable prices but because of their long-standing love affair with all things British. 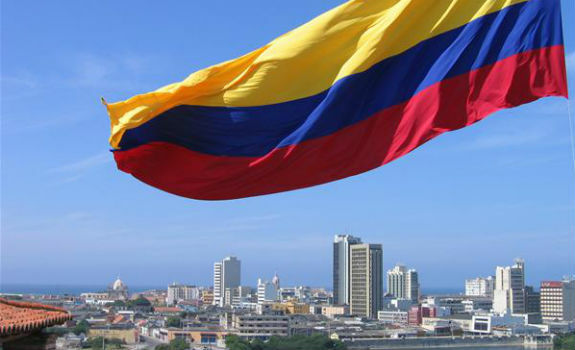 This relationship dates back almost 200 years, because of Britain’s role in the independence of Colombia. I saw those influences in the city’s style – think Shoreditch chic – so I could easily see stores like Topshop or Next slotting in nicely in the local shopping centres. Talking of British institutions, the Hay Literature Festival is also a prominent fixture on the Colombian arts calendar. In recent years the festival has branched out internationally and now takes place in Cartagena, in the North on the Caribbean coast. Big names have also joined the festivities in recent years, like Ben Okri, Rosie Boycott and Dylan Jones. I honestly cannot explain to you just how incredible it was to sit and listen to movers and shakers in the finance, fashion, retail and arts worlds sit and talk positively about the economic future of a country that’s willing to embrace new technology, creative ideas and investment on all levels. I also can’t find the words to describe how it felt to land back in the UK to be faced with yet more economic doom and gloom on the newspapers’ front pages. I know it’s difficult to forget the sins of a country but I’m pleased to say that I arrived back in London in one piece, without a stash of cocaine in my luggage, and no drug lord on my arm. Instead I returned with some wonderful coffee, delicious rum, and a bouquet of Colombian flowers, that I bought from Marks and Spencer and sat on my dining table. Drake, Rick Ross, French Montana Rock ‘Stay Schemin’: Watch! Don Jazzy Remixes D’Banj’s ‘Oliver Twist’: Listen! Columbia is a country that talks positively about their economy — seriously, these places really do exist.